** For darker skin types choose our tinted version with all-natural bronze mica or choose our DIY tint kit to match your skin color. The DIY tint kit contains enough mica to double the darkness of our pre-made tinted version. 100% All Natural & It Works! Sunscreens in general, as well as the specific ingredients used in the production of them, have been the subject of a lot of discussion and controversy over the last decade. While it’s generally agreed upon that chemical sunscreens have short-term as well as long-term health risks, more companies are utilizing mineral ingredients in their sunscreen formulations. While most sunscreens claim to use either mineral barriers or chemical barriers in their formulations, seeing the words “Mineral Ingredients” on a label is not an automatic indicator of its efficacy or safety. 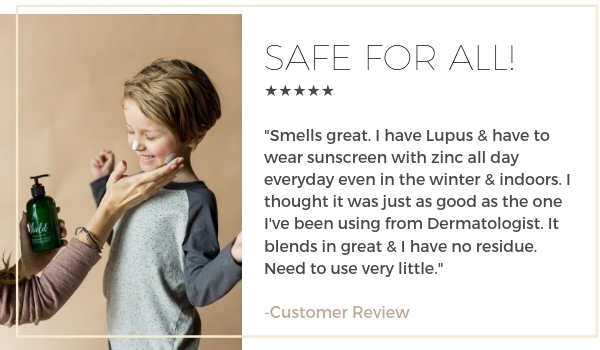 Even sunscreens that boast their use of “Natural Mineral Ingredients” on their label will more often than not use harmful chemicals in conjunction with those minerals in the interest of either boosting their SPF or lengthening the formulations shelf life. -Typically, sunscreens on the market currently use 1 method of filtration of UV rays: Chemical and Mineral. They are vastly different from one another, and generally, mineral sunscreens are considered the safer option. -More than half of the commercial sunscreens that are allowed to be on shelves here in the US would never make it to market in most European countries due to the more stringent standards overseas regarding UV protection. -16% of sunscreens advertised as “Sport” sunscreens contained Retinyl Palmitate, which is a Vitamin A derivative linked to speeding up the growth of cancerous cells by 21%. The inclusion of this ingredient allows companies to put the words “Anti-Aging” on their labels, but the minuscule anti-aging properties of a Vitamin A derivative does not counteract it being a cancer-causing agent. -65% of non-mineral sunscreens contain oxybenzone, which is especially concerning, as it is an “endocrine disruptor” meaning it leads to the reduction of sperm count in men and endometriosis in women. -While convenient, spray sunscreens should generally be avoided, as most ingredients used in sunscreens (even mineral sunscreens) are harmful when inhaled. However, mineral sunscreens in lotion form do not pose this risk of airborne mineral inhalation. Mineral sunscreens that do not use micronized or non-nano minerals also do not pose the same risk of unintended absorption. If using a mineral sunscreen, micronized or nano zinc oxide/titanium dioxide should not be used, as those smaller particles can be absorbed into the skin and have been shown to cause damage to the liver, spleen, stomach, and pancreas. As part of our commitment to provide our customers with the highest quality ingredients, we have decided to utilize non-micronized/non-nano Zinc Oxide as our primary active ingredient in our SHIELD sunscreen. The Coconut and Jojoba oils in our subscreen contribute to the formula’s moisturizing benefits and it’s emollient nature. We use non-micronized/non-nano Zinc Oxide, as it is the safest broad-spectrum mineral sunscreen ingredient on the market. Our use of non-micronized/non-nano Zinc Oxide ensures that the particles are not too small. This prevents the Zinc Oxide from ever absorbing completely into the skin, which can pose health risks. This was a thick white paste on you that you can’t rub in evenly and it makes you look like a ghost. We went for a motorcycle ride and I ended up burned. Then when we got home I couldn’t get the white film to come off no matter what I tried washing with. Ended up scraping it off with my fingernails. All the scrubbing to try to get it off left my skin irritated. COMPANY RESPONSE - November 15, 2018 10:21 AM - Hello Trish, we're sorry to hear that you had a bad experience with Shield but happy that you were able to return it for a refund. We can see that you made your purchase 13 months ago and thought you would be pleased to know that this product has since been reformulated and we provide an optional tinted version that blends into your skin. I bought the tinted version and was very satisfied.... I have olive colored skin. it did make my skin slightly lighter than normal... but really was not noticeable. This stuff really works and does not allow you to burn. It also makes your skin soft. I highly recommend! As a cancer survivor, this is the only sunscreen I'll ever use. All natural with zinc. I decided to try the Jade Bloom sun screen. I ordered both the "white" and "tinted mica" formulations. I'm sad to say that I literally hate this sunscreen. I used the products on myself and my 5 kids. The white formulations leaves a yucky looking white residue over the skin, especially on someone who is not outright pale. The tinted mica version is almost like makeup, it was so "makeup like" in consistency and color that I could have used 2 coats of this and covered a tattoo (not at all what I was going for). It also leaves a fair skinned person looking PINK, nothing in close to "bronze" or "tan". Both formulations are extremely heavy feeling, literally like a makeup foundation. Both formulations will literally change the color of your skin (either pastey white or Patrick Star pink) in a very unflattering manner. Smell wise, yes its fabulous. That's about the only good comment I have for this product. The tinted version is amazing! It’s all natural still but looks normal on your skin!! Amazing! Effective and divine-smelling with beneficial skin ingredients just like the original. A !!!!! Thank you Jade Bloom!!! Smells great. I have Lupus and have to wear sunscreen with zinc all day everyday even in the winter and indoors. I thought it was just as good as the one I've been using from Dermatologist. It blends in great and I have no residue. I didn't use the tint in mine. Need to use very little. Feels and smells so good I recommend not tinted see my comments. I love this sunscreen. I got it in a combo package with bug spray which is gone already. I only wished I had gotten non tinted. I’m naturally olive toned and the sunscreen tint is pink. Too pink and doesn’t blend in otherwise it’s smell is amazing. And works great stays on the skin even in the water. I am new to Jade Bloom products but trying to do more natural things for my kids sake cause of all the chemicals in products these days. I really like the sunscreen. It did the job and smelled good also. It does leave a bit of a white residue but it really isn't all that notice if you're as pale as I am :) It works well and smells Really good too! This is a wonderful alternative to commercial sun products! I love it. Used this past weekend on grandkids and it worked great. This is my favorite sunscreen. It doesn’t burn my eyes or irritate my skin. It doesn’t contain any harmful ingredients. The ingredients are actually good for your skin! It’s almost like getting a treatment each time you apply it. Smells divine. I’m trying the tinted version next for my legs! I have ALWAYS had trouble wearing traditional sunscreens (and I’ve tried a ton) because I sweat and my eyes get irritated. This doesn’t irritate my eyes. Also, it has a cool texture. It’s basically a liquid. It smells Devine. I actually enjoy applying this to my face because of all the good skin ingredients and the smell. As far as effectiveness, check. It works. Great, safe sunscreen. I can't believe how well this works. I got it just before I went on a island vacation. I used the tinted on my face. Can't say enough good things about it. Except don't put it in your carryon luggage. Nice smell and thick white liquid that needs to be rubbed in but it works well. Don't like how it turns my skin white so I will return it and try the tinted. I'm excited about this plant based sunscreen. Just beware that a little goes a long way. Don't overdo it and end up wasting your product! This sunscreen is a HIT! Purchased this for my niece and nephews who have very sensitive skin and our quite finicky on what they will allow on their skin, to boot! My sister used it and we were both surprised that there was no screaming and squirming. The test came after everyone was out under the sun for a day's worth of games and cheer: no burnt noses, not red cheeks, and no "ouchy" spots. Thank you, Jade Bloom! Will be keeping this on hand for my sister's rascals!! I'm sure this is a great sunscreen but it is very thick and white. Wanted it for my face but it feels too heavy and makes me look like a geisha girl! We used this at the beach and had no sunburns on fair skins. A little goes a long way. It is nice to have natural ingredients in a sunscreen. I am an avid tennis player and have a hard time finding sunscreen that doesn't drip and burn my eyes... until now! I love this product! I am able to protect my skin and use a chemical free product. It smells great too! I have been telling all of my friends and family about this sunscreen! I love the smell! So much better than all the other sunscreens out there. Not sure yet of its sun blocking abilities but I will add to this once it is used. It has been raining here so no way to use it yet :( but it feels decent when I apply it, though it does seem like it takes a lot to wash off, but in a way that's good because it means it'll stay put when swimming! I've used this product twice now and I really don't like this one, but I really do like Jade Bloom products. It does work however it leaves your skin feeling dry and weird feeling- I couldn't wait to wash it off both times. I ordered Jade Bloom's carrot seed oil and am hoping to use this with a carrier oil instead for a sunscreen. My family has been using it with great results. Most have commented about it leaving your skin white, yes it does a little, but it's worth the protection. I put this product to the test for two weeks at the beach. Yes, it leaves a white film, but it isn't too bad. I assume it is the active ingredient doing its job. For the first time in 10 years, I have been able to enjoy the sun without getting raised, red whelps on my arms and chest. I'm sold on Shield. Thank you, Jade Bloom, for an awesome product. I used the new sunscreen on my face and the tops of my hands, everything else was covered. I mowed my yard, which is an acre plus and then did more outside lawn work too! It's hot and humid here in north Texas. The new sunscreen worked great! It didn't wear off and smells good too! Thank you Jade Bloom for another great product! I put this on before I mowed the lawn. I applied it once in the morning. I mowed for about 6 hours. I only burned where I could not reach on my back, I really like this product. I really like this sunscreen. It seems to work very well and has a pleasant odor. The only reason I only gave 4 stars was because it does not rub in to your skin. It leaves a layer of white wherever you apply it. I will use this sunscreen over anything I can buy in a store because it's all natural. I will try this product again but wasn't impressed the first attempt. I love that it is natural. The smell is pleasant. I didn't even mind that it doesn't rub in easily. My kids we're outside swimming for 1hr and 45 minutes and they became pink with minor sunburn. I'll try again and use more and reapply after 1hr and see if I get better results. The sunscreen smells great but when you apply it leaves your skin white no matter how much you rub it in. Regardless, I will still use this instead of the garbage sold in stores that contains all of the chemicals. I normally burn through almost anything. I tried Jade Bloom sunscreen and didn't even get pink. I was astonished. Even getting wet kayaking. I applied every 4 hours. A must have for your outdoor activities. I won't be without it. Smells good but turns skin white. I really wanted to like this sunscreen but no matter how much I try to rub it in, my skin stays white. It smells good though. Maybe Jade Bloom can improve it somehow. As some other reviewers stated it leaves a thin layer of white paste on your skin that you can't rub in, I did try! I applied it to my arms, legs and face before heading out for a walk and I like the smell but it seemed difficult to rub in... needs to be a little creamier... and didn't think anything more till on our walk I happened to look at my arms and they looked pastie white! I tried to rub it in but was not successful. This is exactly what I have been looking for in a sunscreen. I have Lupus and dobits very important that I "shield" myself from the sun. I have tried SO many different brands of sunscreen, both traditional (chemical) and natural (physical barrier) and I have not found one I like. It leaves a heavy white layer on you.. I bought this sunscreen for my grandchildren. I will make sure to keep this on hand. It comes out fast so easy on the pump bottle. Goes on thick so you don't need a lot. Smells great and gives good good protection from the sun. Love this sunscreen. Purchased very expensive brand at beginning of summer but much prefer Jade Bloom brand. love the smell of this sunscreen. It works great and feels good on the skin, although its tricky to get all of it to absorbed without looking white. I would buy it again anyways, because the fragrance of the essentials oils are wonderful. This is the best natural sunscreen I have ever used. It has simple, yet brilliant ingredients. Great for your skin and protects it from the sun with a SPF of 30. Feels amazing and luxurious going on and a little goes along way. I love the simple pump bottle as well. Floored. A little goes a long way. It seems liquidity at first, but goes on rich, silky and feels very moisturizing. The scent is subtle and not overpowering. This is a much healthier choice for myself and my family and I'm happy to have found it!